Lago de Atitlán is surrounded by mountains and three volcanoes and is estimated to be up to 340 meters deep, the deepest lake in Central America. Approximately fifteen towns or villages lie on the perimeter, mainly inhabited by traditional Mayan peoples and pretty touristy. 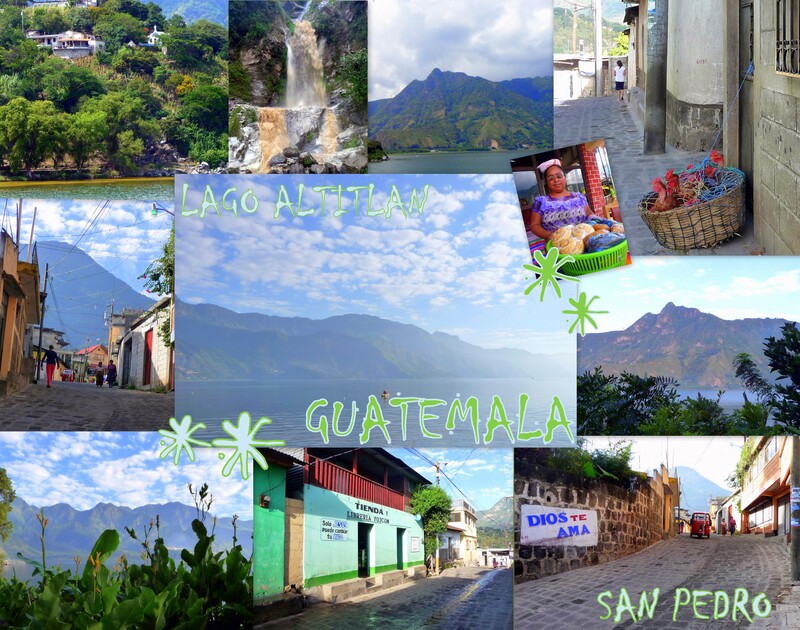 We stopped for 2 days in San Pedro La Laguna, just on the lake border. After visiting Chichicastengo market we went to San Marcos by boat. Small village in front of San Pedro said to be the prettiest village of the lakeside, indeed! Water is supposed to be clean & you can swim there… Well, not exactly now… Apparently, since few weeks already, the lake is completly polluted, and you can see it! Just when we arrived in San Marcos, we met a young American girl, asking her for directions, who end up for a really interesting drink, explaining that the lake is in real danger & that people need to find a solution or it might be the end of it… She arrived here 6 month ago to stay 2 years on a volunteer project & this is a real coincidence that she is a specialist of water pollution! They hope to find something quickly, together with the population as the main problem seems to be their habits of washing clothes & themself in the lake. However as she said, it might be difficult to change this quickly… We all hope for the best!!! 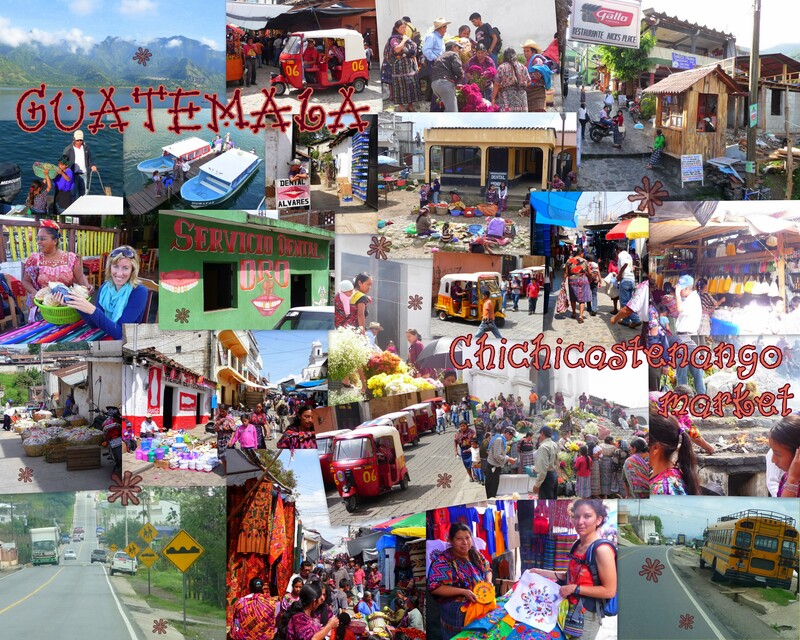 Chichicastenango is known to what is said to be the most colorful native market in North and Central America, perhaps in all the Americas. Market days are Sundays and Thursdays, and draw not only the Mayas of the surrounding region, but vendors from all over Guatemala, representing many of Guatemala’s linguistic groups such as Mam, Ixil, Kaqchikel and others, each hawking his or her products in a riotous cacophony of color, dialects and costumes, smoke, and smells. 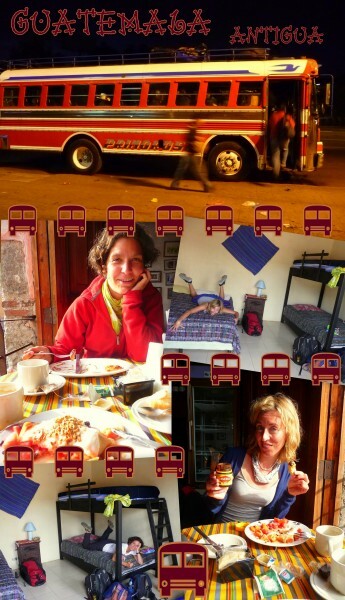 After reaching San Pedro La Laguna the night before – good that we spent nearly 5 hours in the bus as it was raining! – we had a nice breakfast in front of Lake Altitlan before leaving for the market. First we made it with an agency collectivo up to Las Encuentros & then in a local one. More fun People keeping on jumping in or going out of it, always trying to fit as much as people as possible Lucky us, for the 1st way, we were in front - as sometimes it was really tricky… On the way back we were 23 people inside instead of normally 15! We changed for a comioneta at Las Encuentros & went back down to San Pedro in the old US School bus on tiny bendy road, driver honking at nearly each bends & even sometimes having to drive a bit backward in order to be able to turn… Another way of travelling! 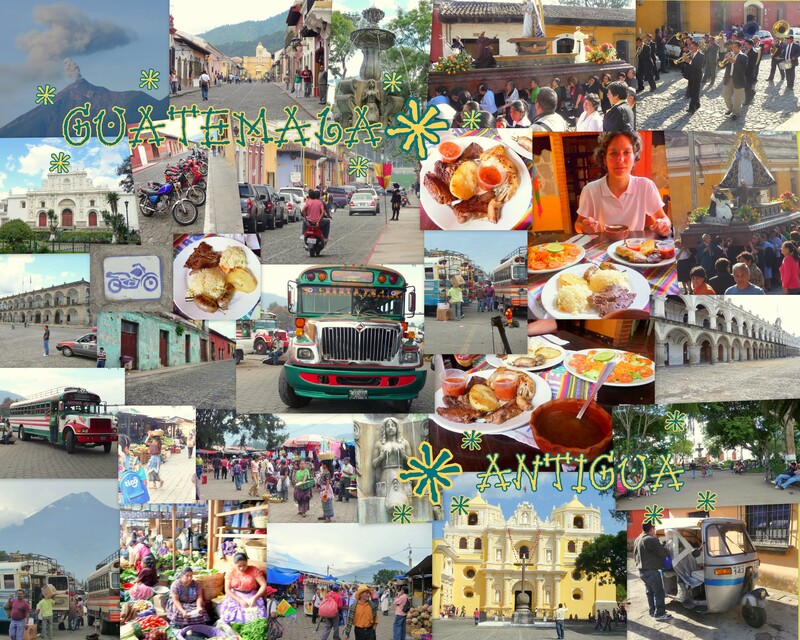 Guatemala is located on the boundary of two tectonic plates, which makes it a geologically very active area. 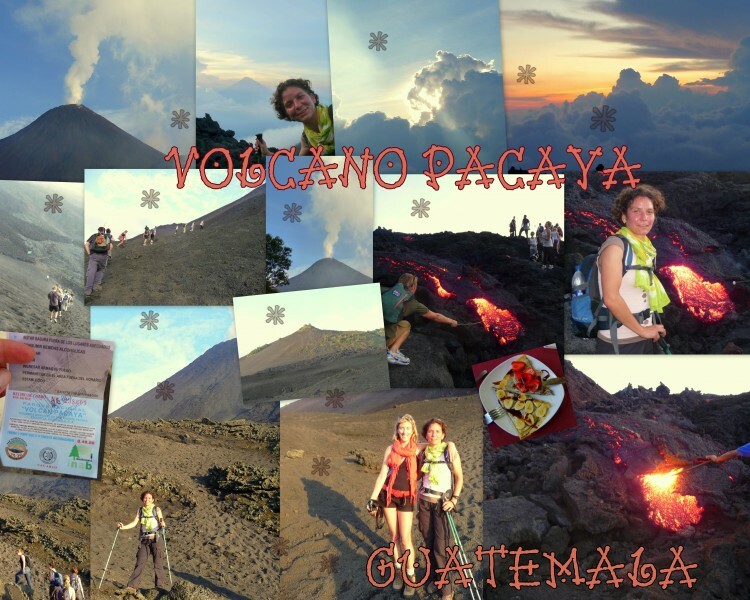 With a height of about 2,500 meters above sea level, the Pacaya Volcano is relatively easy to climb – if you take your time & don’t rush to go up – and gives you a spectacular view from the top! As we had our Spanish course in the morning, we decided to do the sunset & night tour – one of the most popular… Climbing is not too difficult, however, better taking your time as you’re leaving from 1850 metres to reach 2300 meters. 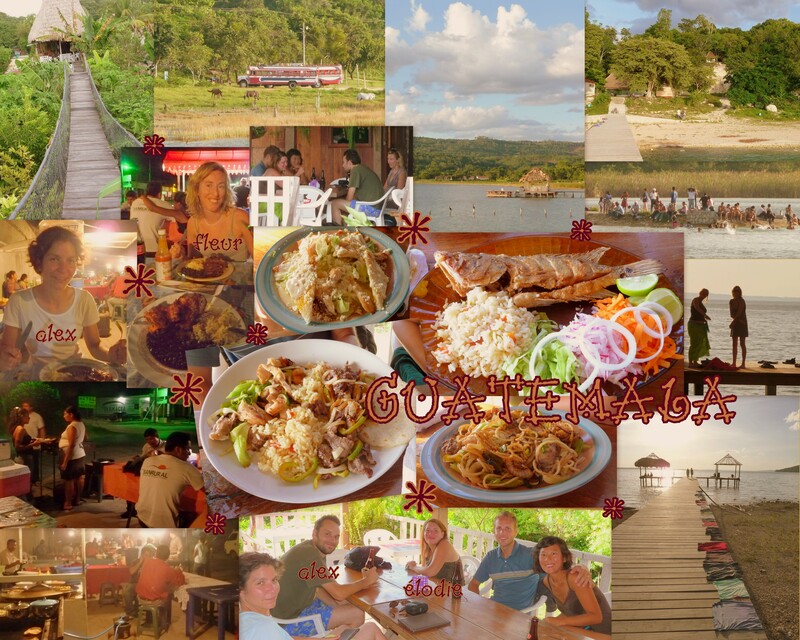 You have no other choice than taking a guided tour – as it seems to be the way nearly everywhere in Guatemala… Guided tour is good but you have to follow the group, or try to! Luckily, for once, I wasn’t the lowest one & anyway, I decided to take my time – better if I wanted to reach the top! In this tour, everything is made to make you pay a bit more… Just before going out off the bus, driver offered to rent some wooden sticks “absolutely necessary” as well as to buy flash light to go down after sunset… – he even took some kids from the street into the bus to make the sticks promotion! I was glad to have mine – as Fleur was – for the way down, even 1 is really helpful! – & as well as my frontal light! After a bit less than 2 hours, we finaly reach the top. So rewarding to see the lava so close & this beautiful view! We now understand why they were selling some machmalos down… Pity we didn’t buy any! Our tourist information guy was finaly so convincing that we ended up enrolling for some Spanish course (also check tips&advices if you want more details on a lovely & professional school) for 4 days, 5 hours a day, leaving in a host family from the next day… Ok, we already planned to take some course but we wanted to have them on the Lake Altitlan… Change of plan For our first afternnon we went to discover this lovely touristy city, reminding me a bit of San Cristobal de las Casas in Mexico. They are plenty of good restaurants, and one we tasted (El Sabor del Tiempo) which is offering wine from all over the world. I know some people who would have love it! Arriving to Antigua was an unforgetable experience… 8 hours bus – confortable enough to sleep a little bit. We arrived in Guatemala City at 5am, not even realising we were there! As soon as you go off the bus, taxi driver are literally jumping on you to drive you anywhere you want – even to Antigua! Still sleepy, Fleur & I tried to figure out what was the best option to get to Antigua… The bus station looks like nothing… We had absolutely no idea where we where, only option seems to trust an official taxi driver – they all have the same shirt, so it make you a bit more confortable thinking they might be safer – to bring us to another bus terminal to reach Antigua city. Price negociation at 5am, after a night in the bus is not really easy… We ended up at a close bus station in a scarry area for 2 girls so early in the morning… Of course our nice taxi driver offered to bring us to another one for another fee! No real other choice as he would have leave us there! We finaly arrived to a more crowded place – not less scary – but at least with a camioneta – or chicken bus as foreigners call them – leaving right away to Antigua. Such an great experience… First, our luggage were packed on the roof with all other big items. At 5:30am the bus was filled up in a minute, people squeezing on each other, stepping in & out regularly. Instead of beeing 2 we where 3 per seats with another person in between as well as people standing in the middle path… Unbelievable, so much fun to see! After more than 1 hour in such unconfortable position, we arrived in Antigua A couple of people, seeing us with our luggage, offered hostel room. First thing we wanted after such experience is to have a rest & a breakfast! So we stopped on the first nice place we’ve seen After a great breakfast, we started to look for a hostel. We met a guy – who had to convince us pretty hard to follow him, but after he said he was working at something like the tourist information, we kind of trust him - who bring us to a lovely hostel with a beautiful view on the volcanoes all around – what a relief after such a travel! Crossing the border was a great adventure! First stop at the small frontier post to stamp the passport for exiting Mexico. 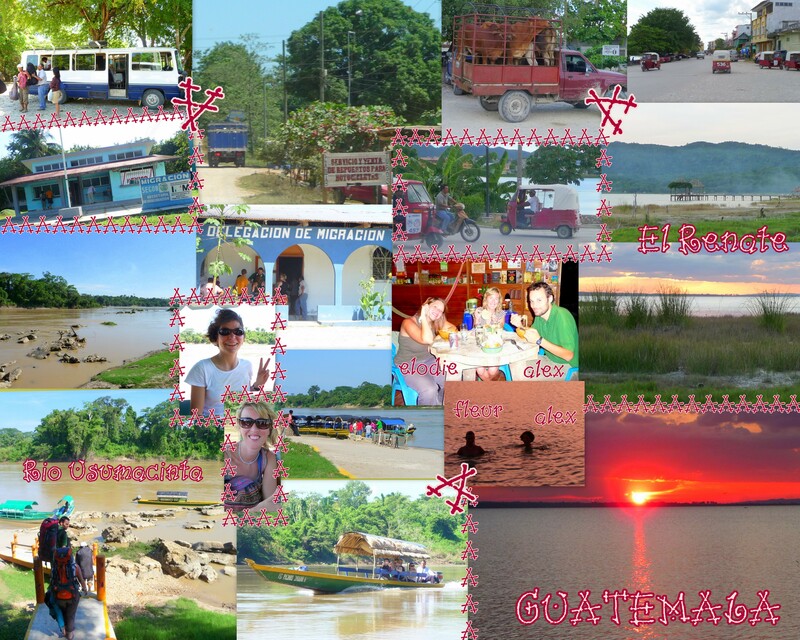 Then, as for visiting Yaxchilán ruins, we took a lancha to cross the Rio Usumacinta which is here the border between Mexico & Guatemala, but this time with all our luggages! On the other side, a bus was waiting for us. Another stop on the frontier post for passport stamping – where we had to pay 40 Quetzals (!) & more than 2 hours drive to Flores. With a belgium couple (Alex & Elodie) we met the day before, we made our way directly to El Remate to a small family hostel on the lake border half way to Tikal. People were really friendly there! We had a swim in the lake - as it was really warm! 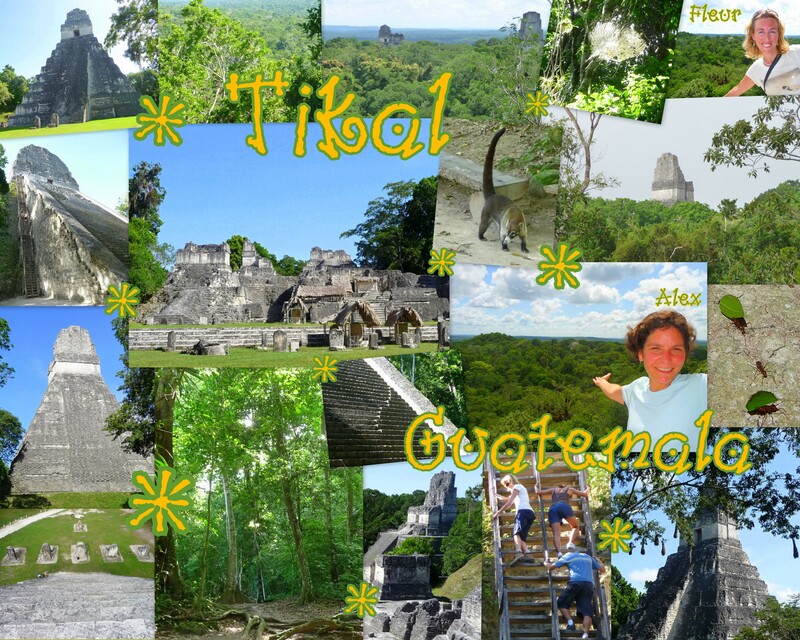 – watching the sunset, before going for a vegetarien diner in a restaurant hold by a German guy & is Guatemalan wife We all went to bed pretty early in order to be ready to leave for Tikal ruins at 5am!